In one of my first IT jobs (back in the dark ages) we had something called the thirty minute rule. Kind of catchy right? But what did it mean? Simply said, if you have made no progress on a problem for 30 minutes go find some help. The idea is that after a certain amount of time you’ve exhausted all of your immediate resources and it’s time to get a second opinion. If 30 minutes doesn’t seem very long, well, I guess it really isn’t. This was 20 years ago and things were a bit different then. There wasn’t an internet to search (at least not in the same way), no forums, etc. Our options were books and each other. These days I generally use a 2-3 hour rule, but you can use whatever you are comfortable with. We’ve all been there. An obnoxious problem that you just can’t solve. You can tie yourself in a knot, spend days going over and over the same pieces of information. After 2-3 hours the rule comes into force. You have to stop and force yourself to get some help. It doesn’t even have to be someone all that knowledgeable. Just someone to jog your mind a bit. Sometimes all it takes is explaining the problem to another person. The act of condensing the problem into something for someone else’s consumption can clarify it for you. If you don’t have someone else to talk to then write up your question as a forum post. 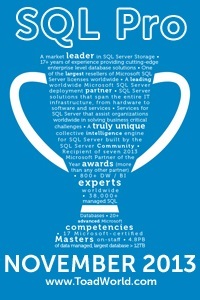 Or maybe tweet a 140 character summary of the problem to the #sqlhelp hash tag. You would be amazed at how much time I’ve saved myself over the years. Pick yourself an amount of time, make your own rule and see what you think. I’ll bet you’ll find you love it as much as I have. The amount of times I have had a problem I can’t get my head around started to explain it to someone else and worked out the answer myself. Yep. Exactly. Somehow when we think about a problem ourselves we frequently just don’t organize it as clearly as when we go to explain it to someone else.